If you want to make BIG money, you've got to be bold. You've got to be willing to step up and bet against the crowd at extremes. You've got to find the idea that everyone sees as a slam dunk – the one they're all certain about – and bet against it. Ideas like that certainly don't come along every day. And believe me, you won't make friends with this strategy. Most folks will think you've lost it. After all, the conventional wisdom sounds good. It's safe. But it's also ordinary... It won't lead to outsized profits. So again, if you want to make big money, you've got to bet against the crowd at the right time. You've got to be a contrarian. Today, I'll share one of the most contrarian opportunities in the world right now. It might seem a bit crazy. But if you act now, you have a chance to earn double-digit profits with little risk. If you're looking for a contrarian bet, look no further. The yield on 10-year Treasury bonds will crash from near 3% today to below 2% within the next six months. Conventional wisdom is that U.S. interest rates can only move one direction... up. The problem with conventional wisdom is that when everyone's bought into an idea, it usually doesn't work. Right now, everyone is betting on higher interest rates. And that makes lower rates the smart bet. 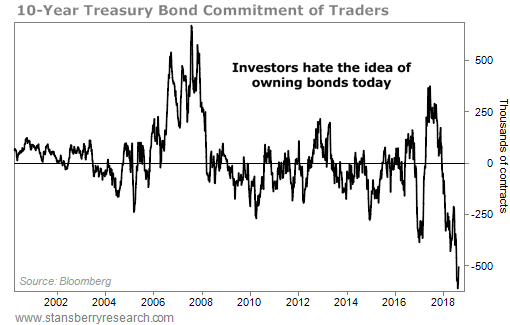 You can see this crazy sentiment in the Commitment of Traders (COT) report for bond prices. This report publishes weekly and shows us what futures traders are doing with their money. When traders are all making the same bet, the opposite is likely to occur. The COT report began looking at bonds in 1995, and in all that time, these futures traders have never been close to today's negative sentiment. The closest we've seen to today's extreme was early last year. Nobody wanted to own bonds then, either. And bond prices rallied double digits in six months. The simple way to make the trade back then was through the iShares 20+ Year Treasury Bond Fund (TLT). It holds a basket of long-term U.S. Treasury bonds. TLT rallied roughly 11% from early March 2017 to September 2017. An 11% rally over six months is impressive – bonds are usually "boring" assets that don't move quickly. Today's sentiment is even worse... This is the likely the most hated asset in the world today. And that means the upside potential here could be even higher this time around. This is the most contrarian bet I see in the markets today. So if you want to make big money, consider being bold and betting on lower interest rates. Shares of TLT are the simplest way to do it. "Most individual investors shouldn't buy stocks at all," Porter Stansberry writes. "They should only buy bonds." Learn how owning bonds can help you achieve your investment goals with less risk right here: Stop Buying Stocks. Recently, investors gave up on stocks in one corner of the world... And it isn't China. Learn more about how this contrarian opportunity is shaping up right here: This Is the World's Most Hated Market Right Now. 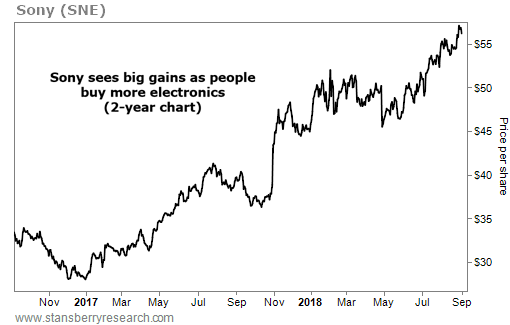 Sony (SNE) is a $70 billion electronics giant. The company makes everything from TVs to cameras to gaming consoles. These types of “nonessential” products fly off the shelves when consumers have extra cash in their pockets. And that looks to be the case right now… Sony reported sales of nearly $18 billion in the most recent quarter, up roughly 5% from the same quarter last year.